There is a solid reason and story behind the celebration of every festival. There is also a story of 'Karwa Chauth', a festival held by the women for the welfare of husband, which women hear in the form of fasts on the day of fast. 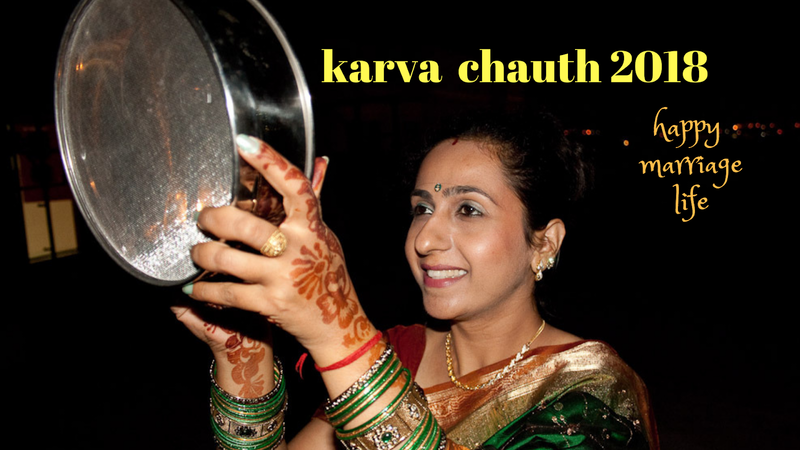 By the way, Karva Chauth has many stories, but all of them have the same origin. It is said that reading of the fast story on Karva Chauth takes great importance. This practice has been going on for centuries and all the married women follow it completely. Kartik Krishna Paksha is called Chaturthi by Karwa Chauth. In this, Ganesha is worshiped by God and he is pleased with Poojan Dan, the law has been written in Chaturthi of Chaitra. But the specialty is that in this, carvings of wheat are worshiped and the married girls here are sent from the peas by the sugarcane. And after listening to the following story, fasting is opened in Chandradrath.Story: There were seven sons and a girl from a moneylender. Bai ji! The moon is not gone right now, your brother is showing the light of fire by sieve with danger from you. Even after listening to Bhabhi, he did not pay any attention and gave food to the light shown by the brothers and took food. Ganesh ji got disillusioned with this light dissolving. After this, her husband became seriously ill and she was in the sick of the house. When he came to know of the faults he had made, he regretted praying for Ganesh and started the fasting of Chaturthi from law. Having respected everyone according to his duty, he took the mind into receiving the most blessings. This light was pleased with Lord Ganesha, seeing the karma along with his reverence and devotion, and after giving health to his husband, he made him wealthy and wealthy. This light, who renounces deceit and trembling with devotion and devotion to the Chaturthi, will be happy in all its ways. you only ask for your eyes, so that your entire life will be spent happily. The old lady, after listening to the son and daughter-in-law and neighbors, thought in her house, in which her son is very good and all my goodness should also be demanded and demand anything of her own. When the second day Shri Ganesh came and said, what does the elderly ask for? It is our word that you will ask for it. Hearing Ganesh ji's words, he said, 'O Ganaraj! If you are pleased with me then give me nine crores of happiness, give healthy work, give me immortal, give light in my eyes, grands my grandchildren, and give happiness to all the family and finally give salvation. Upon hearing the old lady, Ganesh said, 'You mother, you have cheated me.' Well whatever you have asked for, all you will get. By saying yes, Ganesha became infighting. Hey Ganesh! Just give an example to the elderly mother as you gave everything to you. And please bless us. Take a thinner place of thirteen in a plate to lower it, keep a little sirra, a sari blouse and rupees as much as you like. Rinse the plate around the plate and turn it over to the feet of your mother-in-law and give it to them. After that, feed thirteen Brahmins and send them by giving them dakshina and putting them in villa. Bas Ek Din Ka Rahe Upvaas. Aaj Pyara Sa Karva Chauth He…. A dark cloud of gloom is hovering my heart,Am praying for your happiness and long life,You are always in my heart,Missing you very much on this Karwa Chauth. When I say I love you,It doesn’t mean just 3 words of love,It means I care for you,I trust you, I believe you, I miss you,Love sometimes changes some moment And sometimes Whole Life!Happy Karwa Chauth. Hamara Majboot Rishta Dikhata Hai..